Valletta’s favourite Saturday happened with a bang this year. 100 events. Over 1,000 creative participants. More than 70,000 visitors experienced the largest cultural event in Valletta. This year’s Notte Bianca, returned bigger and better than ever. Notte Bianca has now become a staple on the Maltese cultural calendar. Every year locals and tourists of all ages flock to the capital to immerse themselves in the unique atmosphere created by the creative energy of hundreds of artistic events, the assembly of people from all walks of life, the feeling of communality through gastronomy, and of course the rich history and heritage of Valletta. The festival’s holistic approach to arts and culture truly places Valletta, and all of its singular attributes, firmly in the spotlight. Among the many innovative projects this year was Ġejja Dgħajsa. The project transformed Strait Street into a sea of paper boats set on metal stalks, which moved and swayed at the slightest touch. 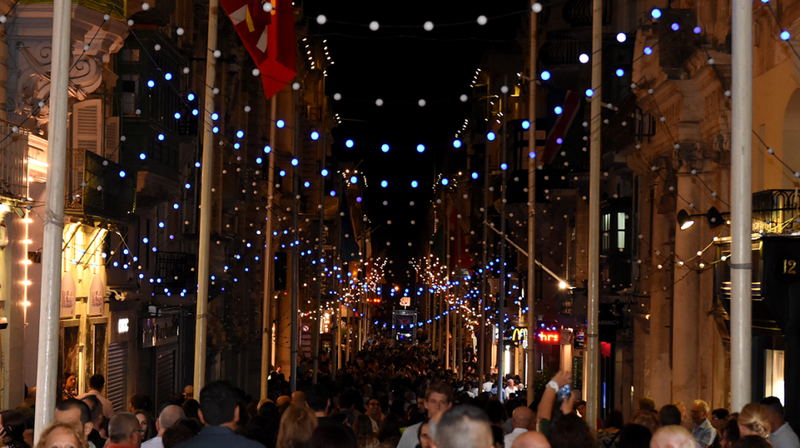 Festa Festun, an interactive light installation played on one of Malta’s quirky feast traditions. It allowed members of the public to control an array of 1,000 individually addressable light bulbs along Republic Street to create grandiose visuals full of movement and colour. This year’s Notte Bianca also hosted community projects such as Serata Kamrata headlined by Ċikku l-Poplu, who also left the community space better than it found it. This was in line with the festival’s ethos. Improved logistics and social media exposure also assisted in improving the festival’s accessibility and reach. The special ferry services from each of the Three Cities to Valletta, allowed Birgu, Bormla and Senglea to become more integrated into the festivities. While the use of live streaming through Facebook, allowed those who could not be physically present in the city to experience Notte Bianca’s highlights in real time. Next year, Malta will captain the European Union’s Presidency, while 2018 will crown Valletta as European Capital of Culture. These two honours will give Malta the opportunity to showcase its festival organising talents to a more global audience. The success of Notte Bianca 2016 is proof of what Malta and local creatives have to offer the international cultural scene and why Valletta is deserving of these prestigious honours.